On Tuesday, I walked along ankle-deep roads to get to roads too deep for walking. A police car was parked by Witton Creek where the water rose halfway up the signposts. Flashing red and blue, a latter-day lighthouse. Bats, by the hundred, wheeled and squeaked through the spaces in the still-daylit sky. By Wednesday afternoon, those same streets were rivers. Rooftop archipelagos. The river was a taste of the never-after. Brown and surging, it widened beyond its usual boundaries with magnificent wrath. On Indooroopilly bridge, three young guys with a crate of beer whooped exuberantly at every piece of debris that passed. Sticks, tyres, whole pontoons with the railings still attached. Days grew dark and brightened. At the university, the lakes joined forces with the sports fields to create a new smile-shaped loch, parallel to the river. Bone-dry in my house, I was mildly inconvenienced when the power went out for an evening. Five minutes’ walk away, people ferried possessions from their houses in boats. A few metres less hill, and my house, perhaps my year, would have been sucked into the swirls of distress. As it was, I watched rolling news coverage obsessively, while the power was on. Two screens; input from the TV, output reassurances across the globe into the computer. Most of my messages were the same; sarcastic, slightly hassled assurances of my safety. But I loved having to write them; in the absence of being a part of the blitz-spirit community, these messages made me a little closer to a part of the event. By Thursday afternoon, Channel 7 news was referring to it as the worst natural disaster in Australia’s history. By what criteria, I have no idea. But the scale was astonishing, the footage compelling. People airlifted from rooftops, horses treading water metres above their paddocks. A huge section of walkway came detached and floated down the Brisbane river, risking disaster if it collided with the Gateway bridge. Two heroes—quite seriously, heroes—heard of its progress and set out with tugboats to nudge it around 90 degrees. It slipped between the uprights of the bridge like a train through a tunnel. 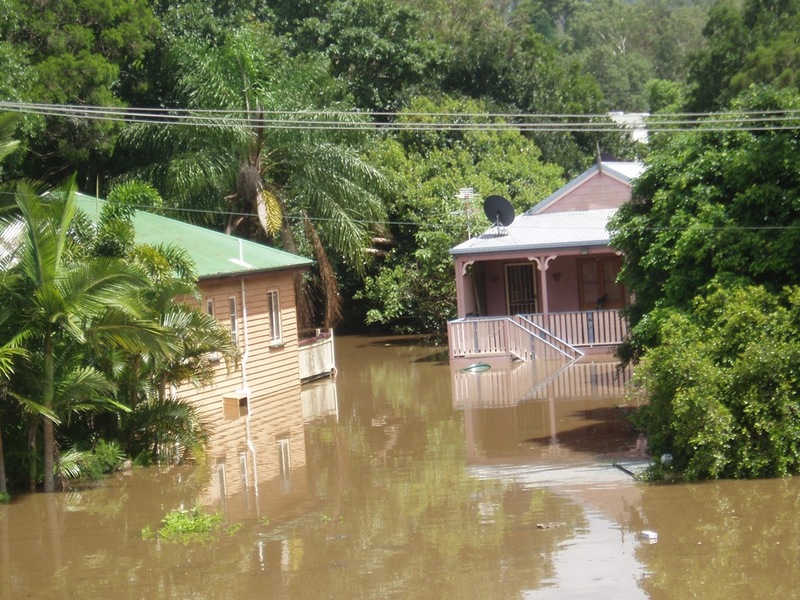 The floods have lain over Queensland for weeks. A much-exchanged statistic held that the flooded area around the cities of Rockhampton and Bundaberg, and extending deep into the agricultural country, was the size of France and Germany combined. And these thoughts and these statistics take your breath away and make you pity, of course they do. But compassion is contingent; it’s only when you’ve a target to feel concerned for that it begins to catch in your throat. Bites at your eyes and holds them fixed. Danger morphs from a word into a sensation. 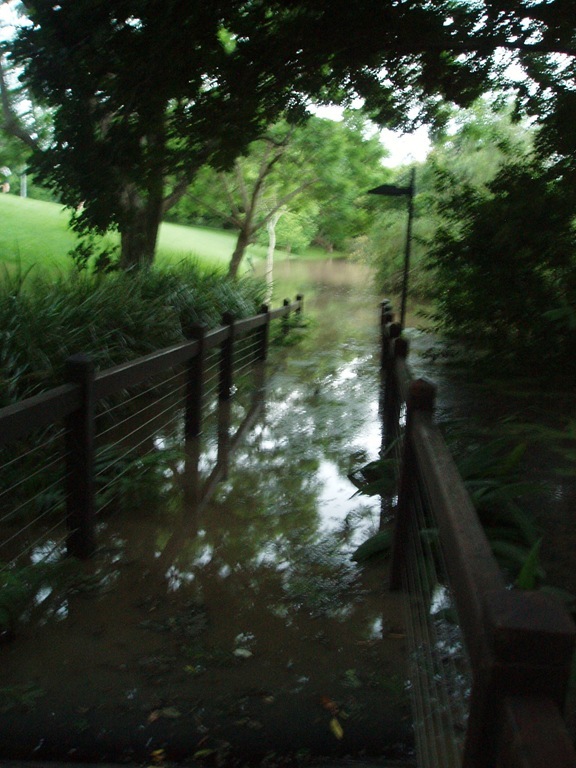 This, my flood, began on Monday night, when Toowoomba, 65 miles to the west, was hit by an “inland tsunami”. I sat with Rachael, whose family—the amazing people who took us in over New Year—are residents there. Thankfully, all are safe and well. We watched the flood of YouTube clips and phone videos: Cars swept away, people stranded, rush after rush of frothing red-brown water. See this on the news and it’s disturbing, but when you’re close to someone who it affects, the whole context changes. I was completely useless at offering reassurance, just sat and watched dumbfounded—and I was two steps removed. By the morning, Toowoomba’s death toll was eight, with seventy-two missing. The high street, scoured by what amounted to a tidal wave, was slowly turning from a river into a muddy creek on the rolling news footage. And a new word had entered the newscasters’ vocabularies; Brisbane. Now, it’s Sunday night, three days since the river peaked. 4.46 metres above normal levels. Brisbane is doing its best to recover, to pull dry air back into its lungs. 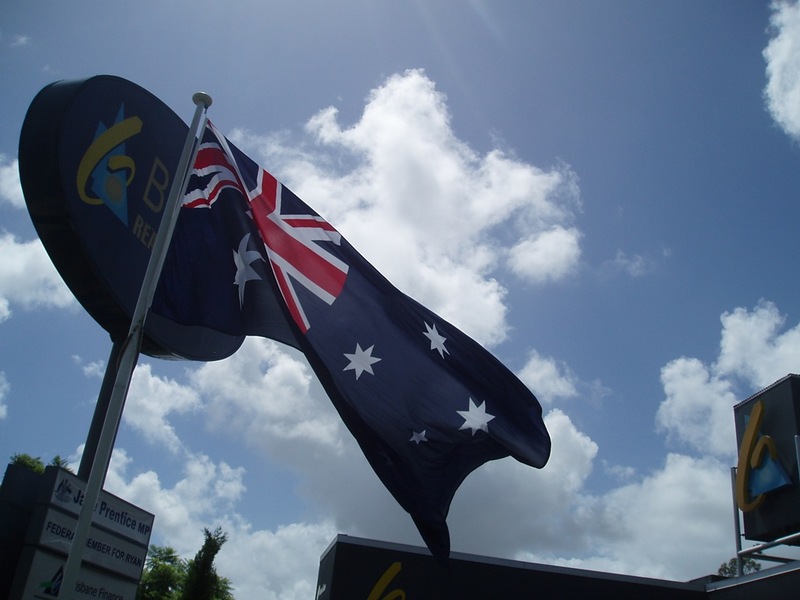 It has to be said—no, it has to be—the people of Queensland have been magnificent. Practical and proud and tough as teak—and moreover, organised. Australia’s leaders, Julia Gillard and Tony Abbott, may have spouted the same soundbites as any politician across the world would, but those more locally responsible—Anna Bligh, the premier of Queensland, and Campbell Newman, the Lord Mayor of Brisbane—have impressed time and again. Both came across as honest people working their arses off to make the best of a rotten situation. Their organisation, and that of Brisbane City Council, has been immaculate. It would be easy to get wrong, in so many different ways. Katrina. And the people on the streets have laughed, and persevered, and saved each others’ lives with the practical ease of the unfailingly unfailing. Occasional horror stories of those swept away are hugely outnumbered by interviewees shrugging off personal heroisms. Even the horror stories: the boy who died after pushing his brother to safety. So now, they clean their city. We turned up—Thomas, Rachael and I, along with a cheerful local called Bruce we befriended en route—to the city’s biggest volunteer centre, clutching shovels and brooms and ready to offer our services. We queued for an hour before being told that there had been so many people turn up to help that there were no buses left. Only Thomas, further ahead in the queue, got onto a bus: when that bus arrived in Rocklea, there were too many volunteers already there for him to be able to help. They’d hoped for 6000 volunteers over the day, and got them by midday. Someone said 11000 showed. We spoke to people who’d come all the way from the Gold Coast to help out; I’ve heard stories that some people rocked up from Melbourne. The city won’t recover fast; the city beach at South Bank, for one, is likely to be a morass of silt for some time to come. Worse off are those in the country; this was meant to be their bumper crop, their wet season to pull them back into solvency after a decade of drought. 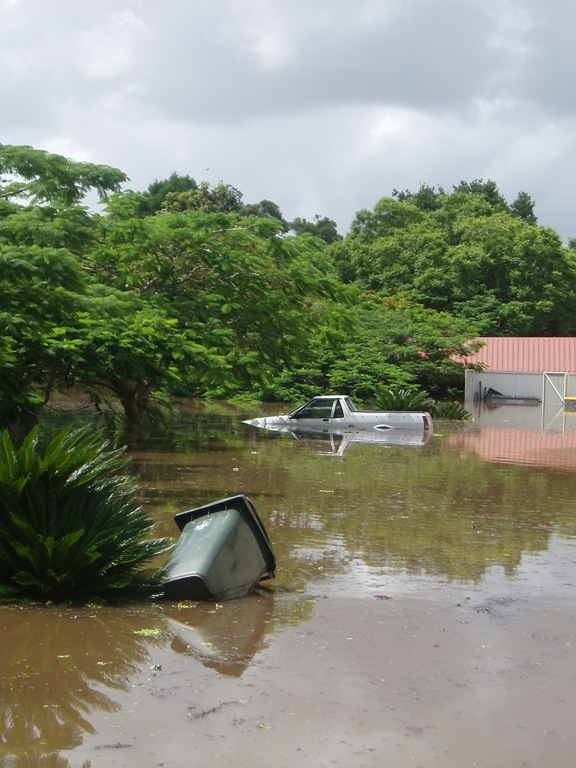 Wet season went into overdrive, and now farmers face two lost harvests. And there are those who weren’t fast or lucky enough to escape the water at all. All you can do is hold your heart out. But the city, and the country, will recover. It’s shown its sinewy heart, and it will. And though of course I’m not glad this disaster happened, I’m glad in many ways that I was able to see it first hand when it did. To see the cruelty of water and the fire in people. QLD, you have my sympathy. My admiration. Equivalent of France and Germany flooded = horrendous, tragic. People travelling a different equivalent of Germany and France to help out = amazing. Faith-in-humankindish stuff. A lot of the world can learn from this. I hope it does. Jesus christ this is awful, thinking of you.